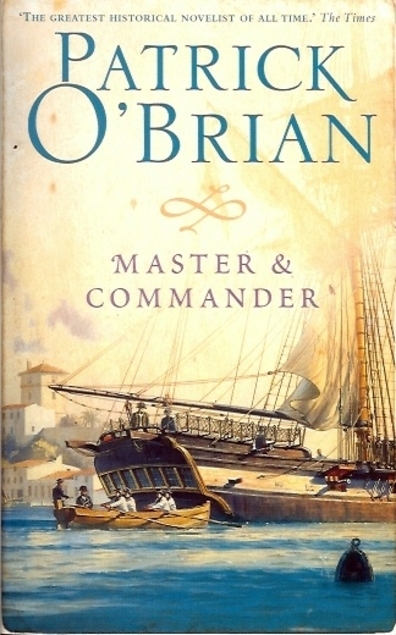 I decided to read Master and Commander by Patrick O’Brian because it’s the first book in his Aubrey-Maturin series. I recently discovered that an ancestor of mine was transported to Australia (for campaigning for the vote to be extended to all men) on the Royal Naval ship Surprise, but that is the third in the series. Sadly the series begins in the early 19th century, but William Skirving was transported on 1794, but I’m looking forward to reading O’Brian’s description of the ship. This is the first book by Patrick O’Brian that I’ve read . I can see why his books are very popular but it took me a while to get into this one as for my liking there wasn’t enough in the way of character and there was just a bit too much action. But by the time I got towards the end it seemed to have evened out a bit. Jack Aubrey has been unlucky in the past and his career in the Royal Navy hasn’t been as he wished, so when he unexpectedly is given the command of His Majesty’s Sloop Sophie he’s absolutely thrilled. Sophie is undoubtedly not a thing of beauty, she isn’t all that strong either but Aubrey quickly gets down to fitting her out with a crew, guns and powder as well as food and water. He feels especially lucky to sign up a young doctor/surgeon, the crew are always much happier with a doctor on board. Stephen Maturin is just as happy to get on board as he is at rock bottom. Aubrey wants money. Basically the British government of the time supported piracy and the Royal Navy went about attacking foreign ships, seizing the cargo and imprisoning the crew, and the British crew got a cut of the ‘prize’, with the bulk of it going to the British treasury. So the book lurches from naval action to naval action, with a lot of sailing terms being bandied about. It was all go with the Sophie sailing along the Mediterranean coast attacking every ship they saw, and being very duplicitous about it too. I could have been doing with a glossary, I did end up looking up words such as snow, settee and tartan – all different types of ships, and there were a lot more of them. In my copy of the book there’s a nice drawing of a square-rigged ship, hung out to dry in a calm. The sails are all numbered – all 21 of them, so when the mizzen topgallant mainsail was mentioned, you could look and see exactly where on the ship it was. Until then I had no idea that the phrase ‘hung out to dry‘ was a naval term. I must admit that O’Brian writes some lovely descriptive passages, below is a sample. Stephen could remember an evening when he had sat there in the warm, deepening twilight, watching the sea; it had barely a ruffle on its surface, and yet the Sophie picked up enough moving air with her topgallants to draw a long straight whispering furrow across the water, a line brilliant with unearthly phosphorescence, visible for a quarter of a mile behind her. Days and nights of unbelievable purity. I’ll definitely keep on with the series as I think the books are historically authentic and there’s a lot to be learned from them, in a painless fashion. The Times has dubbed O’Brian as being ‘The greatest historical novelist of all time.’ Have you read any oh his books and if so would you agree with The Times? You can read what Helen @She Reads Novels thought of the book here.